Intel launched its Kaby Lake G platform in December 2017. However, the laptops with KABY Lake G are quite rare enough, and that surprises us all Intel fans. The successor to the Kaby Lake G has already been unveiled in the form of Kaby Lake H in March 2018. The new platform already has come up with a huge number of laptops. But, why aren’t laptops with Kaby Lake G visible as they should have been? If you are someone who is like us and checking out the options for the laptops with Kaby Lake G platform, we present the select list of the rare options available at our disposal. EMIB connect with HBM2 memory powered by custom AMD Radeon VEGA graphics. Before we can move on to list out the best laptops with the Kaby Lake G processors, would it not be a good idea to understand the lack of Kaby Lake G powered laptops? One of the reasons possibly is the Nvidia putting the brakes on the proliferation. The Kaby Lake G platform is developed with the amalgamation of an unusual Intel CPU and AMD GPU marriage. Though we may not be sure, the rumors have been suggesting that Nvidia has been lightening the lid with its anti-competitive terms. This has caused the major manufacturers to back off from the program. 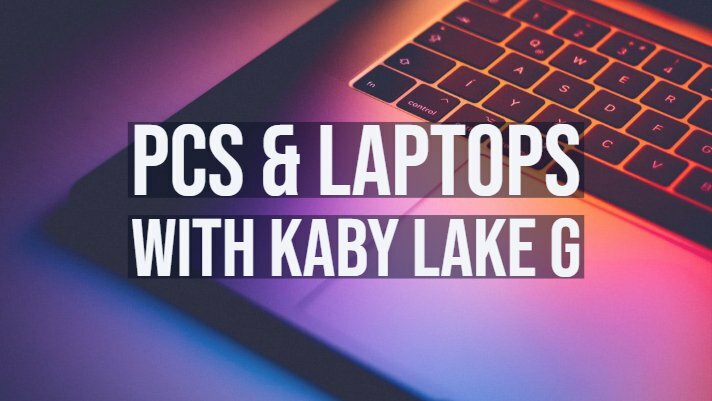 Having understood the possible lack of the laptops based on the Kaby Lake G platform, let us now move ahead to check out a few available laptops that are powered by Kaby Lake G platform. 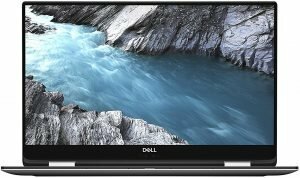 That should be one of the prominent attempts by Dell for trying out the not yet proved option of Kaby Lake G. It is one of the rare XPS formats, and the laptop comes with a two in one form-factor. However, please ensure that you have not confused it with the regular XPS that the computer is derived from. Intel Core i5-8305G Quadcore Processor 6M Cache. Some variants (post customization) comes with Core i7-8705G. The laptop offers you 8 GB RAM at 2400 MHz. There is also an option of 16 GB RAM as well. You also have access to a 720p Widescreen webcam. The connectivity options available on the laptop include two Thunderbolt 3 (full-lane), two USB Type-C 3.1, MicroSD reader, 3.5 mm combo audio, and Noble Lock. It offers you 9.5 hours of battery backup and provides excellent performance. If you are interested in trying it out, you may find more information at this link on Amazon. 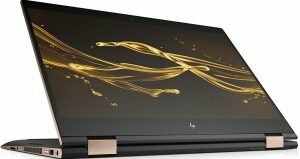 Powered by 8th Generation Intel Core i7-8705G, the HP Spectre x360-15t Quad Core should be one of the excellent choices for your needs. The laptop comes with two options of Kaby Lake G and other conventional alternatives. The laptop offers you the connectivity options of two Thunderbolt 3, one USB 3.1 Type-A, HDMI, SD reader, and 3.5 mm combo audio. The long-lasting battery with HP fast Charge makes it the best option for your needs in enhanced performance. The scratch-resistant Gorilla Glass protection will make it an ideal option if you are someone who uses your device quite roughly. It also comes with an IR camera and a fingerprint reader for easy access functionality. If the laptop and its features have impressed you enough, you can consider buying it from here on Amazon. 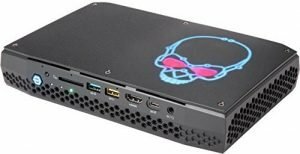 If you are looking for a mini PC for gaming, the Intel NUC NUC8I7HVK Mini PC should be the best you can go with. 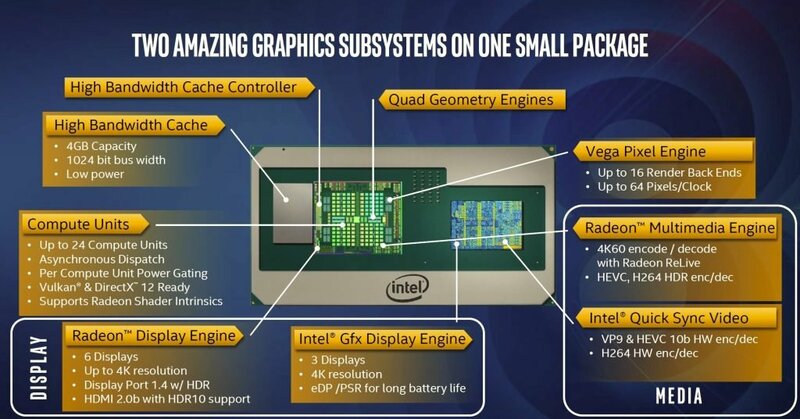 Equipped with the slower i7-8705G CPU and Radeon RX Vega M GL GPU, it is the poster child from Intel for the Kaby Lake G platform. A vast number of ports makes for expandability makes it an excellent choice for most of your needs – Thunderbolt 3, Gigabit RJ-45, mini-DisplayPort, HDMI, and USB makes it the best option for all your connectivity options in one single laptop. The laptop comes with the 16 GB RAM at 2400 MHz. The laptop also has six video ports to work with six monitors simultaneously. Does that make it one of the best options for your gaming and other requirements? Check it out an Amazon. Chuwi is the second mini PC to come equipped with Intel-AMD Core i7-8709G CPU. Chuwi has planned to crowdfund this mini PC and designed to offer faster CPU-GPU performance. The laptop or mini PC is powered by 8th gen Intel Core i7-8709G coupled with Radeon RX Vega M GH graphics. If you are looking for connectivity options, the mini PC has an excellent collection – five USB ports, one Thunderbolt 3 port, two HDMI ports, two display ports and one each of headphone and microphone jacks. The mini PC will come preinstalled with Windows 10 Home 64 Bit edition. Do those features appear interesting enough? Why not gather more information at the official Chuwi website for more details? Kaby Lake G is quite uncommon, and thus it is not much possible to find many laptops or mini PCs that come with the processor that comes with Intel CPU and AMD GPU combination. We could see only the four options featured here, and we found almost all of them promising enough. Have you found any of the other options with the Kaby Lake G configuration? Do share your insights with us.